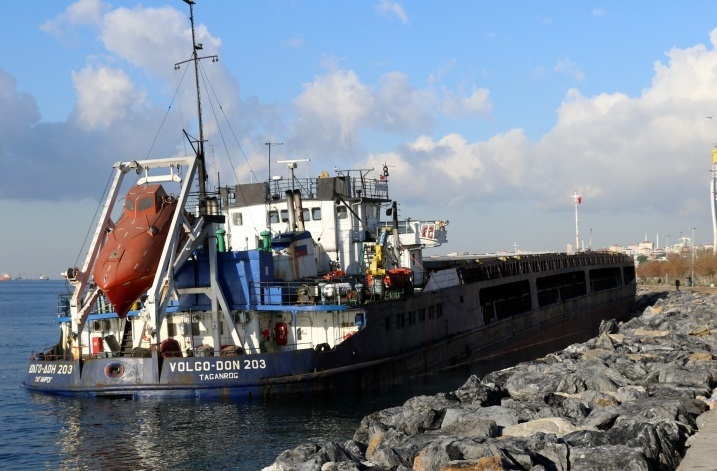 The general cargo ship Volgo-Don 203 partially sank at Kartal in Tuzla area, Turkey. The vessel was pushed by storm over the embankment in east Istanbul channel and suffered breaches in stern area below the waterline. The general cargo ship Volgo-Don 203 started getting water ingress in the engine compartment, which flooded and caused partially sinking of the vessel. The accident was reported to the local authorities, who evacuated immediately the 14 crew from the general cargo ship. There were no reported injuries, as well as no danger for additional worsening of the situation with the troubled vessel, as she rested bottom with stern side. The circumstances around the accident were not clear, but investigation for the root cause of the accident is under way. There were no injured people and no water pollution. The authorities will consider refloating of the ship after weather improves and additionally estimated the damages. The traffic at the area was not disturbed by the troubled vessel. The general cargo ship Volgo-Don 203 (IMO: ) has overall length of 138.30 m, moulded beam of 16.70 m and maximum draft of 3.50 m. The deadweight of the vessel is 5,659 DWT and the gross tonnage is 4,980 GRT. The ship was built in 1977 by Oka Shipyard in Navashino, Russia. The owner and operator of the general cargo ship Volgo-Don 203 is Russian shipping company Rosshipcom. Scientists Discovered the Real Measurements of the Great Amazonian Reef System, Which Could be a Great Biodiversity Corridor Between the Caribbean Sea and the South Atlantic.